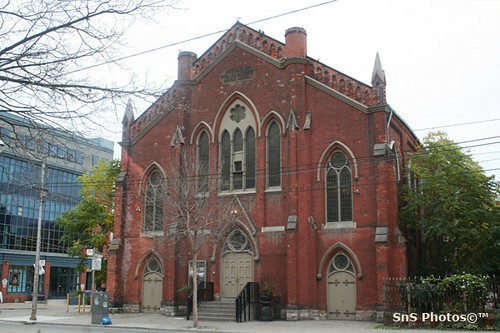 I spent yesterday evening at Berkeley Church on Queen Street East between Sherbourne and Parliament. I was there to witness two of my ball players exchange vows. Raging Storm, the slo-pitch team I manage and play for, used to be called Hooray For Everything. I'm a founding member of this team that formed about eight or nine years ago, and one of the members of that inaugural squad was Jordy, a nice girl who was working at HMV at the time. A season or two later, we added a young guy by the name of Mike Kic. Another season went by before I realized Jordy and Kic had coupled up. The two have been core members of the team ever since and even play on my dodgeball team. I'm not a big fan of weddings. All the pomp and circumstance rubs me the wrong way. Last night, at the very cool Berkeley Church, I enjoyed a very cool wedding. The ceremony was short and very sweet, the speeches were heart felt and sincere and the vibe was comfy and joyous. It was my kind of wedding. There are four female players on Raging Storm, and all four are going to get hitched in the next year. Kic and Jordy were first to bat and they hit a home run. Congrats, kids. Cito is proud of you. Thanks for coming out Booner, we were both proud that you were there to witness it. Hope you had a good time listening to some classic hip hop. A good time was had by all.